Earn up to 15 Vaportiser Loyalty Points. 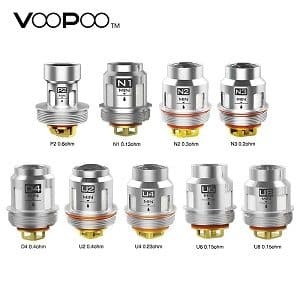 The VOOPOO UFORCE Coil is designed for UFORCE tank, Uforce 2 Tank, UFORCE T1 tank or VOOPOO TOO Kit, which brings great flavor and vapor production. Pack of 5 genuine replacement Voopoo UForce coils, The box comes with a scratch sticker so you can check the authenticity of this product.